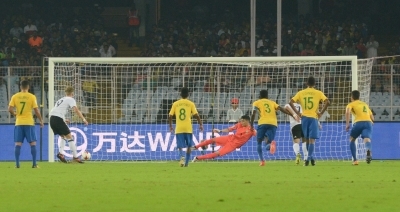 Kolkata, Oct 22 (IANS) Paulinho’s stunning second-half strike helped three-time champions Brazil script a memorable come-from-behind 2-1 victory over European heavyweights Germany in the FIFA U-17 World Cup quarter-finals here on Sunday. The South American U-17 champions have now booked a semi-final date with England. Brazil will take on the English at the Indira Gandhi Athletic Stadium in Guwahati on Wednesday. 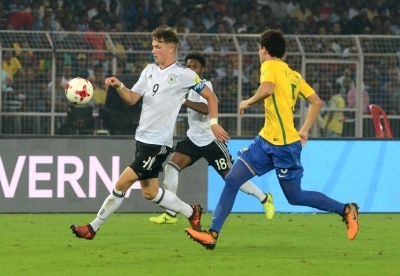 In front of over 66,000 spectators at the buzzing Vivekananda Yuba Bharati Krirangan, Germany weathered the initial Brazil onslaught to take the lead through Jann-Fiete Arp in the 21st minute via a penalty. Brazil, seemingly under the cosh in the first period, stamped their class in the space of six second-half minutes riding on goals from substitute Weverson (71st) and Paulinho (77th) during a quarter-final clash that fully matched its hype. After the winner, Paulinho, accompanied by his teammates in canary yellow, sprinted towards the raucous gallery to celebrate with the fans in scenes that would be remembered for a long time. Germany missed midfielder Yannick Kietel due to a hamstring injury while winger Dennis Jastrzembski sat out due to accumulation of yellow cards. Nicolas Kuehn and Josha Vagnoman replaced the duo. Brazil, on the other hand, started without left-back Weverson with Luan Candido playing in place of him. The opening exchanges saw the youthful exuberance of Brazil pinning down Germany, as the bulk of the stadium rooted for the players from Samba land. The dangerous Paulinho got past a maze of defenders and Lincoln broke through to the box before Alan’s first time right-footer cannoned off the post sending the packed house into a symphony of “oohs”. Moments later, Paulinho combined with Lincoln so swiftly that the German backline of Lars Mai, Yann Bisseck, Josha Vagnoman and Dominik Becker were left chasing shadows. Brazil showed all the glimpses of taking an early lead but their rivals, known for their discipline and meticulous planning, profited from a rigid five-man midfield to close the door on the South Americans. The Germans reorganised themselves and carried a series of raids on the opponent’s citadel, The crafty German John Yeboah looked menacing as he moved into the box, and in desperation Lucas Halter brought him down. Referee Jair Marrufo pointed to the dreaded spot and Arp made no mistake, sending the keeper the wrong way. It was Arp’s fifth goal of the tournament. Soon after, Elias Abouchabaka shot across the face of goal and Yeboah’s stinging cross was cleared by a diving Brazilian skipper Vitao from in front of the goal. The Germans dominated the rest of the half with their midfielders holding sway. Brazil took off Candido with Weverson coming in after the break. 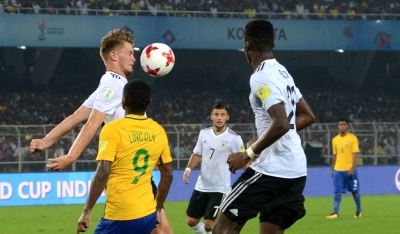 The second-most successful team in the junior tournament should have pegged back in the next 15 minutes First, Lincoln’s strike from inside the box was parried away for a corner by German keeper Luca Plogmann. From the resultant flag kick, Lincoln headed just wide. Lincoln was in the thick of things moments later, passing for Alan across the face of the goal with the latter agonisingly failing to connect. The wave of attacks paid off in scintillating fashion for the yellow shirts. Substitute Weverson rattled the underside of the bar with a thunderous strike after Alan teed him up inside the area while the crowning moment came from Paulinho whose scorcher from 25 yards sent the crowd into raptures. In the final few minutes, Germany threw everything at Brazil but to no avail.